July 17, 2018, Providence, Rhode Island – About a month after leading select students from Barry University and Siena Heights University on an intensive, two-week Environmental Leadership Experience, two of the program’s directors shared that experience with yet another group. Elaine Johnson, Permaculture Specialist for the Adrian Dominican Sisters, and Paula Dias, Program Manager of Mission Engagement and the Division of Student Affairs at Barry University, spoke about the program June 23 to faculty members and administrators from Dominican colleges and universities across the United States. Now in its second year, the Environmental Leadership Experience draws interested students to the Adrian Dominican Sisters’ Motherhouse Campus in May after the close of the school year. Through teamwork, hands-on experiences, talks, meditation, and tours of local sustainable programs, the students learn about eco-systems and the principles and practices of Permaculture, a system of learning from and working with the systems of nature in designing and implementing agriculture. The students are expected to use what they’ve learned to develop environmentally sustainable practices at their school in the Fall. Elaine and Paula gave a special presentation, “Environmental Leadership Experience: Engaging Students in Caring for the Earth,” in a Saturday break-out session at the 2018 Dominican Higher Education Colloquium, at Providence College in Providence, Rhode Island. During their presentation, Elaine and Paula spoke on the Adrian Dominican Sisters’ 2016 General Chapter Enactment to “sacrifice to mitigate significantly our impact on climate change and ecological degradation” and on the environmental sustainability efforts of the Adrian Dominican Sisters, Siena Heights University, and Barry University. Elaine and Paula also spoke of their vision for the future of the program, including possible credit options for participants and a reciprocal trip to the campus of Barry University in Miami to study the tropical ecosystems. Read a fuller description of their talk. Please note that Karen Stalnaker, listed in the schedule as a panelist in the presentation, did not participate in that particular presentation but made a presentation during a different part of the Colloquium. Feature photo: Elaine Johnson, right, discusses hugelmounds – raised beds that include organic matter that ultimately decomposes and fertilizes the crops – with the 2018 Environmental Leadership Experience participants. June 5, 2018, Adrian, Michigan – Rain gardens, berms and swales, Permaculture, eco-systems, zero waste, watersheds, bio-regions, planting guilds – this is the language of a two-week summer program for selected Barry University and Siena Heights University students as they explore and experience the environment and learn to work with and for nature. Now in its second year, the Environmental Leadership Experience brought a disparate group of students to the Adrian Dominican Motherhouse May 13-27, 2018. Through team work, hands-on work, talks, meditation, and tours of local sustainability efforts, the students learn about eco-systems and the principles and practices of Permaculture, a system of learning from and working with the systems of nature in designing and implementing agriculture. 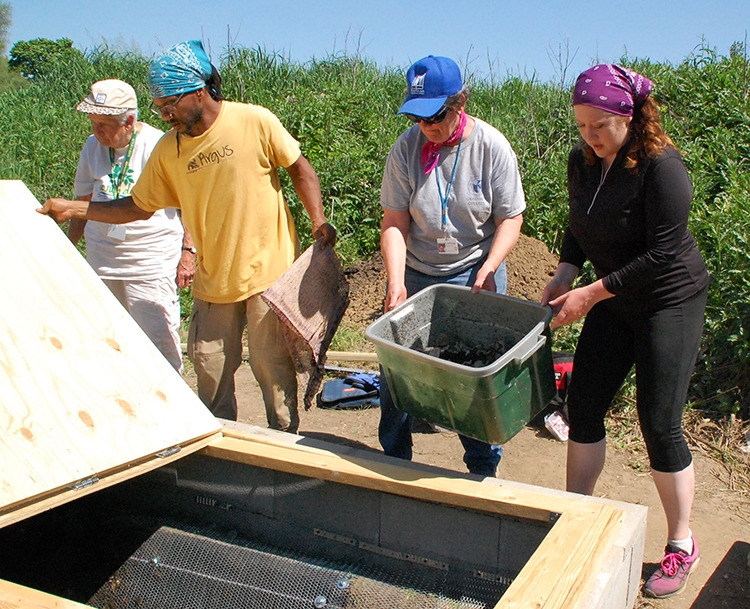 Pictured right: Sister Corinne Sanders, OP, and Sabrina Meli transfer worms and compost from the original vermicomposting container to the newly built system assembled by the Environmental Leadership Experience students. The program is coordinated by Sister Corinne Sanders, OP, Director of the Congregation’s Sustainability Office; Elaine Johnson, Permaculture Specialist for the Adrian Dominican Sisters; and Sister Carol Coston, OP, founding Director of Permaculture. Both Siena Heights and Barry Universities collaborate in the program. Speakers included Sister Patricia Siemen, OP, Prioress of the Congregation and former Director of the Center for Earth Jurisprudence; and staff members from local sustainability sites that students visited. Participants spent much of their time outdoors, working in the permaculture area of the Motherhouse. Service projects included installing deer fencing around the community garden; conducting a waste audit of the Motherhouse; planting an edible forest garden; and building a vermiculture system, in which worms are used to compost organic waste. In a blog, students described their experience and what they’d learned. A key experience for Pa Sheikh Ngom, a Barry University international business major from Gambia in West Africa, came toward the end of the experience. “We saw everything we talked about [earlier in the experience] come together.” After spending their time drawing sketches of a garden, the students had the opportunity to plant trees and shrubs. But along with specific skills needed to work in agriculture and to be good stewards of the environment, the students learned to think in a new way about the environment and about life. “As humans we impose so much on our surroundings – but nature was already there,” said Ashley Ferguson, a Master’s of Social Work candidate at Barry University. “Now I understand that you can look to nature to learn how to build.” She hopes to use some of what she learned in the program to enhance her own garden. 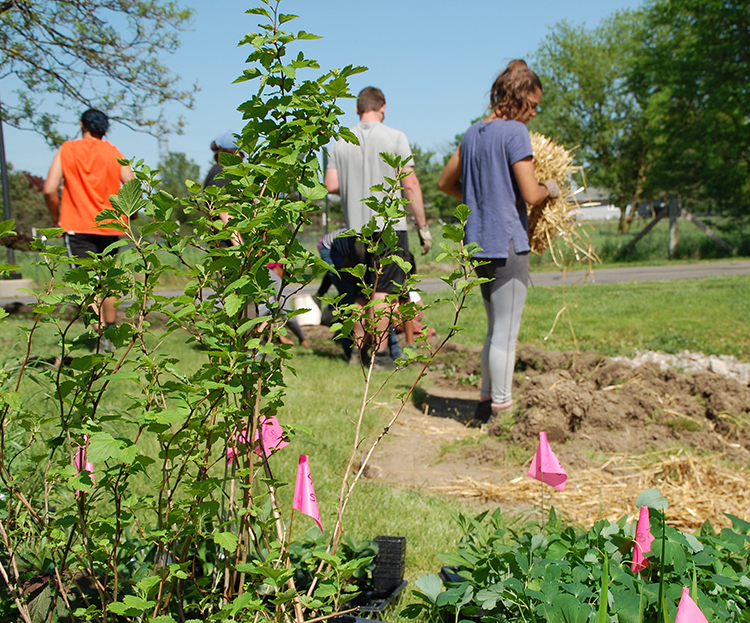 Participants spread straw and plant perennials in the newly installed rain garden on the east-side of the Dominican Life Center parking lot. Rain gardens help slow storm-water runoff on paved surfaces, also known as "planting the rain." The daily practice of meditation and opportunities to speak to the Sisters also gave the students inspiration and a new perspective. Matthew Mohammed, a business and mathematics major at Barry, said the experience “motivated and inspired me to want to travel more. [The Sisters] showed me that there’s more to life than the simple problems we go through every day.” Matthew said he also learned to appreciate the beauty around him – whether the buildings in Miami or the natural surroundings in Michigan. The students – most of whom had never met one another before the Environmental Leadership Experience – came to see themselves as part of a team.